Lots of interesting polling data today, but the headline is that our model has now pretty much fully caught up with John McCain's bounce -- attributing to him about a 1 point lead in the national popular vote. As a result, it also now regards him as the slight favorite to win the Electoral College. As I've disclaimed before, however, we are still in the immediate aftermath of the convention period, and as such all polls need to be treated cautiously. The next movement in the polls is still more likely to be toward Obama than toward McCain. The two results that jump out to me are New Mexico and West Virginia. 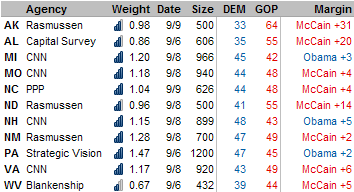 New Mexico polling has been all over the board all year, but Rasmussen -- which had generally had pretty good numbers for Obama in the state -- now shows a 2-point advantage for John McCain. Obama led by just 5 points among Hispanic voters in this poll; he'll likely need to win that group by at least 10 to have a better-than-even chance of taking the state. New Mexico is also a symbolically important state because losing it would break Obama's firewall -- his seeming path-of-least-resistance to 270 electoral votes consisting of the Kerry states plus Iowa, New Mexico, and Colorado. For the time being, however, in consideration of other polling in the state as well as its demographics, our model still regards Obama as the favorite in New Mexico, although it also presently regards John McCain as a slight favorite in Colorado. On the other side of the coin is West Virginia, where a Mark Blankenship Enterprises poll shows John McCain ahead by just 5 points, with a high number of undecideds. This poll has a small sample size and I don't know much about the firm, although it's apparently been polling WVA for quite a while. Those caveats aside, however, if West Virginia is truly polling at just 5 points in the midst of McCain's convention bounce, it becomes a pretty interesting state. Remember, there are a lot of Democrats in West Virginia, and a particularly large number of Clinton Democrats, a group which may be coming home to Obama even amidst his difficulties. And there are not a lot of evangelicals; West Virginia is fairly culturally conservative, but it is not Southern ethnographically. There are scattered reports that Obama has devoted more resources to West Virginia; it remains a long-shot for him, but his staff would surely be doing more good there than somewhere like Alaska. CNN has a series of polling out in Michigan, New Hampshire, Missouri and Virginia. Obama leads in the two Kerry states -- Michigan and New Hampshire -- while trailing in the Bush states, Missouri and Virginia. I don't find any of these numbers terribly surprising. While McCain's numbers have surged among independents, and New Hampshire has the highest percentage of independents in the country, independents are less homogeneous than either Democrats or Republicans, and the sort of high-info, libertarianish variety that is common to New Hampshire probably won't take well to Sarah Palin. Also, note that I use the version of these polls with the third-party candidates included; most outlets will report the other version. Public Policy Polling shows a 4-point lead for John McCain in North Carolina, quite a contrast to SurveyUSA's 20. It appears that PPP weighted by party ID, whereas SurveyUSA did not, which accounts for most of the difference. Yesterday, I was pretty dismissive of North Carolina as a tipping point state for Barack Obama -- and even after seeing the PPP poll, I still am. It is not that the state is completely out of reach for Obama, but that it's difficult to conjure up any realistic scenario in which it's the state to put him over the top to 270 electoral votes. Strategic Vision has Obama just 2 points ahead in Pennsylvania. This looks like bad news for Obama, but Strategic Vision has a Republican lean, and has had some particularly weird polling out in Pennsylvania this year, which has ranged from McCain +10 to Obama +9. At this point, Pennsylvania is still not quite a top-tier swing state, though if Quinnipiac comes out with the same numbers, the model right be ready to change its mind. Lastly, North Dakota has probably followed Montana off Obama's board. This looks like it's basically going to be a seven-state election: Ohio and Michigan; Virgina and Florida; Colorado, New Mexico, and Nevada. Throw New Hampshire and Pennsylvania in there if you want to be conservative, and perhaps Indiana and West Virginia if you want to be aggressive. But Sarah Palin quickly partisanized the electorate, and gave us a considerably less fun map. Oh yeah -- and Palin has given John McCain one heck of a VP bounce in Alaska.